Every Friday, the live music kicks off at 8 pm with a cabaret-style evening of diverse acoustic music at The Oak Room of the Cross Keys Hotel. One of the club’s members co-ordinates a running order of singers and musicians and so visitors who wish to perform should make themselves known (try to arrive at 8.00pm if possible). The acoustics of our preferred room are so good that except for purely electronic instruments, we do not use any amplification or microphones. The atmosphere is informal and includes both rehearsed and impromptu collaborations. Once a month we have an extended slot to highlight the music of one of the many talented performers of the region. 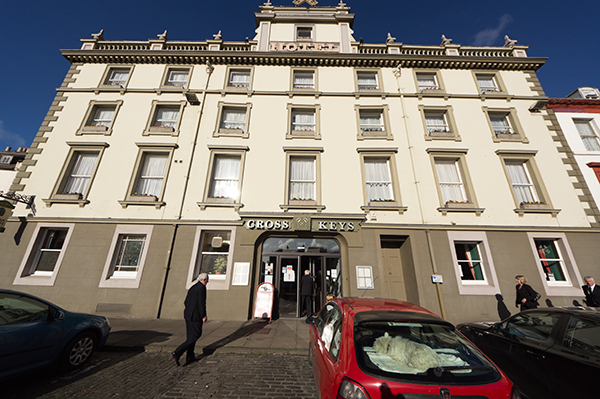 The Cross Keys Hotel can be found at the heart of Kelso, overlooking the town square. There is no charge (voluntary collection), there is a full hotel bar and dining (bar or restaurant) is available. Music finishes around 10.30 pm and a number of our acoustic regulars at this session move on to The Cobbles Inn a few yards away for the later pub session.